"Erdogan Enters Istanbul As Triumphant Sultan Proving So Far He Is Still THE BEST CANDIDATE FOR BEING THE ANTICHRIST. This is it. Saints, embrace yourselves keeping vigilant with oil in your lamps. We have just entered an era of darkness where only the Woman who stomps this crescent moon will stop the red-dragon devil (Revelation 12)." I have said several times already, don't trust Erdogan the man is a radical. But, is he radical enough to stage his own coup? Today, Turkey is under Martial Law, the military who were not loyal to Erdogan are now dead or captured and Erdogan says he may reinstate the death penalty. Some 2,700 judges and prosecutors have reportedly been purged and 6000 arrested overall. Anecdotal evidence for sure, but nevertheless interesting. -W.E. 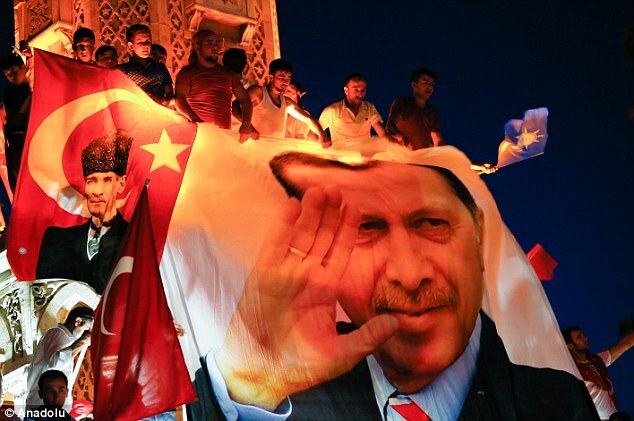 I have to give credit where it is due- this false flag military coup in Turkey was a brilliant move by the Sultan aspirant Turkish President Erdogan at consolidating his power and furthering his goal of creating a neo-Ottoman Islamic super state. No, I do not believe this military coup was an organic uprising. This entire situation stinks of a set-up at the highest levels of the Turkish government. -President Erdogan wants to revive the Caliphate and declare himself a new Ottoman sultan. We have covered this extensively at Shoebat.com, and his actions clearly bear this out. -More than just Merkel and Erdogan, but Germany and Turkey are historical allies since 1453. They worked together in the Protestant Reformation, World War I, World War II, and against the influence of the Catholic Church in Europe. -Turkey and Russia are historical enemies, and Russo-Turkish relations are at a historic low. The Russian government’s sanctions against Turkey have destroyed the Turkish economy and Turkey is desperate to recover. -Germany wants a war with Russia because, as we have discussed at Shoebat.com, it is trying to reassert its imperial past, and part of that includes conquering territories it has fought over against Russia since at least the year 1190. -Who was behind the coup? -What is the end goal of the coup? -What is President Erdogan saying and doing? 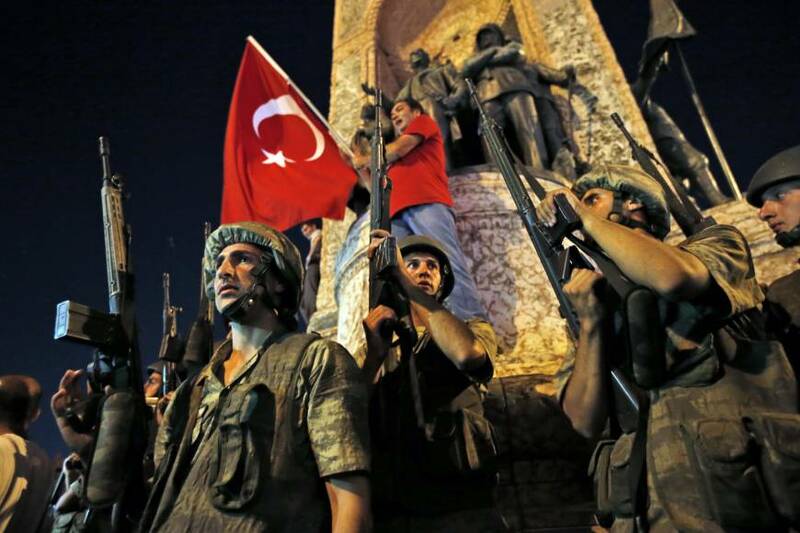 -What is the public response to the coup? -What is the government’s response? -What is the military’s response? -What is anybody else saying or doing in reference to this coup? Looking at all of the information, and given the obscurity of data, it became clear that until some of these questions were answered, at least in part, it would not be possible to get a clearer look at the situation and assess what is really happening. But as an initial analysis, I had two possible scenarios. The first scenario assumes that the coup was truly an act of the military against the government. This could be organized by solely the military, or it could be “influenced” by either the Germans or the Russians. Each group would have competing interests for why they would do it, but the point would be in any case to get control over Turkey in order to use that nation for a greater geopolitical end. The second scenario is that the coup was a false flag event- it would be the government using the military to attack itself designed by nothing other than Erdogan himself. The goal would be to give the appearance of a rebellion, orchestrated at the hands of a few expendable officers, after which the coup would be violently crushed and Erdogan would re-emerged as a “victorious leader” around which people would rally. This would allow him to consolidate his power, purge his enemies with public support, and further his Islamist visions. 1) An entire military coup went from start to fail in scarcely 12 hours. 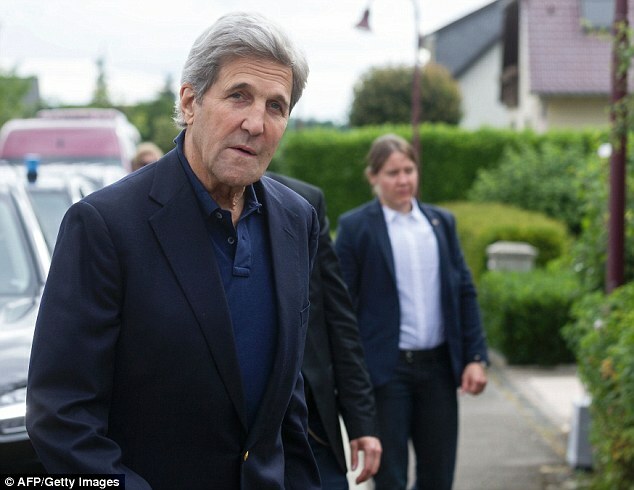 Military coups often times last for at the very least days, and many times can take weeks or even months. And this entire coup is over in barely half a day? Very suspicious. 2) The people are rising up and defeating the soldiers. In a real military coup, anybody who opposes the coup is violently destroyed. They do not allow the vulgar masses to rise up and crush them like what happened today in Turkey, but they rather do what happened at Tiananmen Square in China in 1989- the military just runs over the protestors and keeps going. 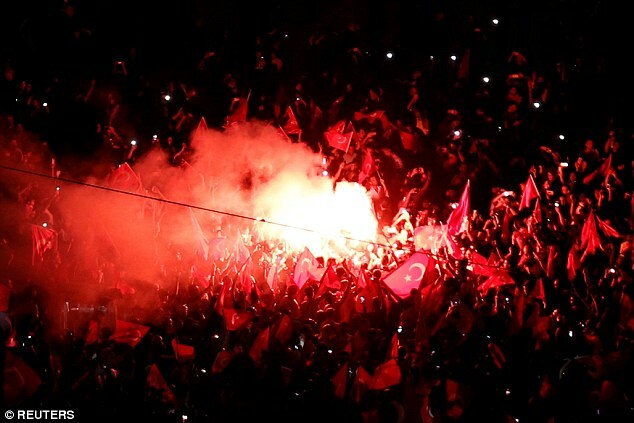 3) After the “coup,” Erdogan’s supporters rushed to him and rallied around him as he suddenly “emerges victorious” and promises to make Turkey stronger and better and purge his enemies. As expected, in a pattern often reproduced in many false flag attacks, the “victorious underdog” Erdogan has now become the “winner” that everybody looks to and will support his decisions without questioning them. 4) Erdogan blamed the Gulen movement consistently for the coup. This was the absolute dead give away. We have reported on Shoebat.com that Erdogan has been caught attempting false flag attacks against the Gulen movement, including the faked assassination attempt of his own son, because they are a hindrance to his Ottoman dream. 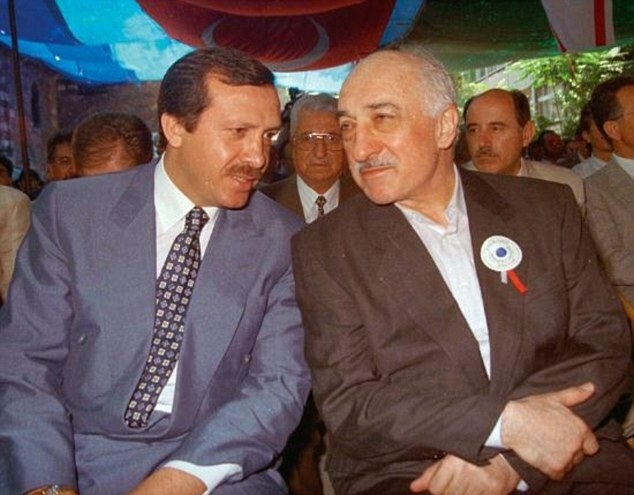 The Gulen movement is not good, as it is Islamist. However, it is an obstacle to Erdogan, and he has wanted Gulen’s influence destroyed since at least 2013. The issue here, just with the ousting of Ahmet Davutoglu, is about Erdogan’s power- he wants no obstacle whatsoever to his ascendancy to the Caliphate. Erdogan has already encouraged people to call him god as well as the new great leader of the Muslim world. But to make sure this new candidate for the antichrist has no competition to his self-proclaimed divinity, he has had to resort to the tactics of devils to purge all opposition. Nice try Erdogan, but we see through you and we know your end game. In response to the attempted rebellion, Turkish authorities have detained 2,745 judges and prosecutors whose loyalty to the regime has been questioned. Also, some 2,839 soldiers - including the head of the Third Army Corps in Istanbul, General Erdal Ozturk - have been arrested. PM Binali Yildrim described the plot, which claimed the lives of 161 civilians with 1,440 wounded, as a 'black stain on Turkish democracy'. 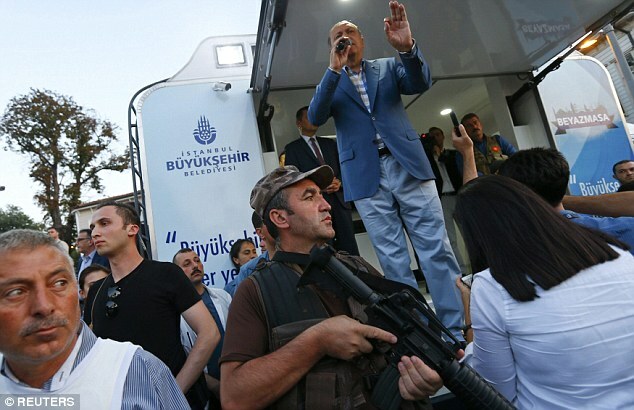 President Erdogan told a crowd chanting for the death penalty on Saturday that such demands may be discussed in parliament after a coup attempt by a faction in the military killed at least 161 people. Earlier Erdogan urged the US to extradite Gulen claiming Turkey never turned down an extradition request from Washington for 'terrorists'. A Turkish government official said the government 'has been preparing a formal application with detailed information about Gulen's involvement in illegal activities. After last night, we have one more thing to add to an already extensive list'. In an incredibly rare interview, Gulen said he would never return to Turkey because he would fear being 'persecuted and harassed'.